So Tanya from Vologda wanted to know about finding French films with subtitles online. A short search revealed filmfra.com, with subtitles in French which appear to be for deaf French people, since they also describe music, sound effects and so on. I found it was best to download the archive, together with 7-Zip to extract the files and VLC media player to cope with the subtitles (other approaches were less successful). Anyway, we both applied ourselves to Ensemble, c’est tout, but Tanya confined herself to watching directly online, which led to a small picture and small sound–and also to slightly corrupt subtitles when I tried it (but she said hers were OK). The copy of ‘Villa Amalia’ I got second-hand from Amazon had this photo in it and this inscription in the front. So what does the inscription say? It looks like: J’adore cette photo première d’un bonheur retrouvé. 26 janvier 2013 But surely the première should be in front of the photo–unless it’s in apposition, in which case there’s a comma missing? If it’s really première then [she] has formed the p differently there and in photo. If you look at janvier [her] v extends below the line, which increases the number of possibilities for the suspect word. [She] and [her] are my supposition from j’adore and an inscription in the front of the book. Restoring the omissions there gives us La souffrance [,l’amour, la musique, la faim] avai[en]t fait d’elle une femme intense–which looks like a case of adapting the sentence to refer to oneself. There are no shes in the photo, which would be strange for a family gathering, so this she might have taken the picture. Let”s call her Ann Hidden, since she’s behind the camera. The man on the left of the picture seems to have the same shaped face as the candle-blower-out, which lends credence to the family gathering idea. 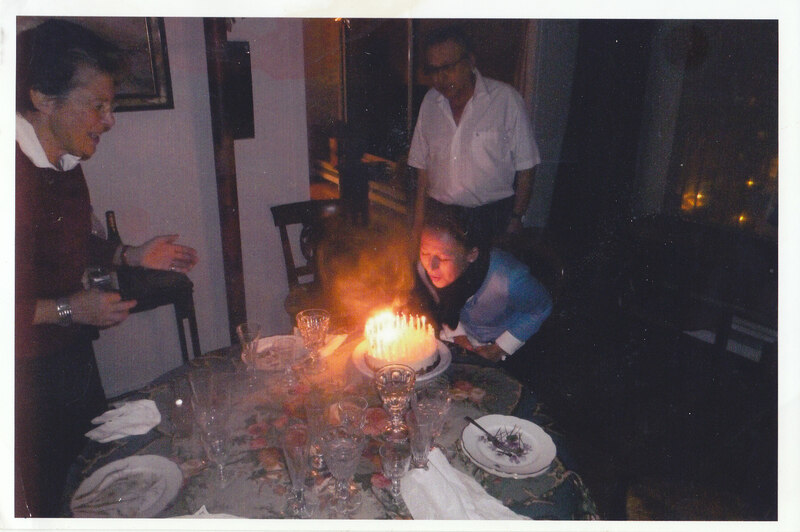 My conclusion for the time being is that it’s not a birthday party–there aren’t enough people–but a family celebration of the lad overcoming some mishap and the candles (say) represent the number of [periods] he was in hospital/prison/rehab/married to that woman, though he looks a bit young for some of those. If it was hospital/rehab, that would explain why he is warmly dressed while the bloke behind him is in shirtsleeves. It’s much easier to leave out punctuation–note that there’s no full stop at the end of the sentence–than put an adjective in the wrong place, so première is a noun in apposition to photo, with some meaning like Première épreuve tirée pour la correction. ‘Galley-proof of happiness’ is quite good really. 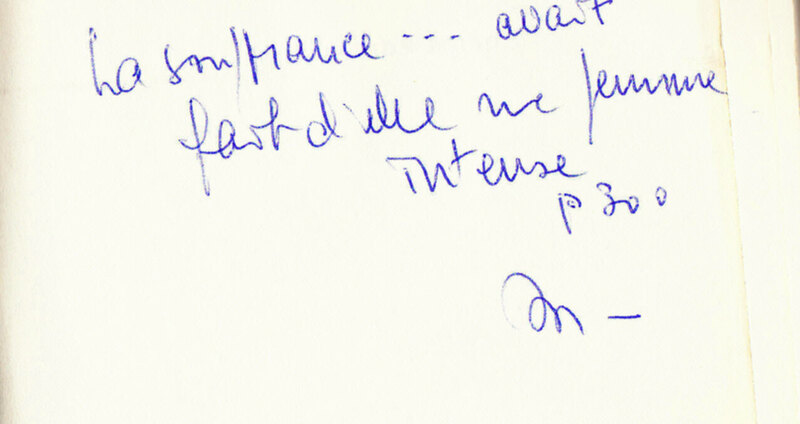 Then the inscription La souffrance…avait fait d’elle une femme intense would fit in well with [Ann Hidden’s] [son] returning from [rehab] [or from death’s door]. D’une beauté qu’on vient d’arracher au sommeil. Je l’ai laissé passer dans son appartement. De son image en vain j’ai voulu me distraire. J’aimais jusqu’à ses pleurs que je faisais couler. J’employais les soupirs, et même la menace. Mes yeux, sans se fermer, ont attendu le jour. I saw her come to the palace last night. dressed with the beauty of one still asleep. bringing out the soft shyness of her eyes? I tried to speak to her, my voice left me. and I let her walk by me to her rooms. I tried to free myself from her image. or, when I needed to, terrible threats. she appeared to me in too soft a light. What do you think, Narcissus? So. The original in in alexandrines (rhymed iambic hexameter) obviously enough, while the translation–has about ten syllables a line, and that’s about all I can think to say about the prosody. The translation certainly gets all of the ideas out and across; it took me 77 seconds to read aloud as against 105 for the original. That lends weight to what one commentator on this production said about the English preference for people doing things on stage as opposed to just talking to each other. How she met Michel Epstein, what their marriage was like–we never really learn. Similarly, while she was determined to love her daughters in the way that she had never been loved herself, it appears that she wanted to have them educated by governesses, so that they (like her) would not have any schoolfriends–an irony that surely deserves some comment or explanation. I also didn’t get an idea of what ways her books are like those of other French writers of her time, and in what way they differ from them. There are odd cases where we learn about the same topics being treated by other writers, but nothing systematic. 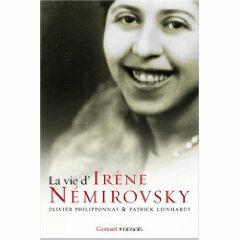 The eternal undergraduate would be inclined to claim that the difference is that at the end of her freedom she was in the Burgundian countryside with no occupation other than writing Suite Francaise and no way of gaining control over her circumstances except by rising above them into objectivity. We do learn a lot about how much she earned for what book when it was published by whom, and indeed the reason given for her never seeking to cross the line into Vichy France was that she depended on a mensualite from her publishers in Paris. At the same time, her mother lasted out the war years in Nice with forged Latvian papers, which makes it sound as though survival was merely a matter of technique. Some time after Irene Nemirovsky had been…taken away…, Julie Dumot, who had agreed to look after her daughters, went to ask for help from their grandmother. ‘I have no granddaughters’ came the answer through the closed door of her flat. But they survived, and so–in the end–did what we know as Suite Francaise. All that will remain of us is love. А как поставить современную русскую пьесу в Лондоне? How to make best use of Conversation Exchange?